So, this is it. This is the culmination of what will be a memorable summer. I am immensely grateful for this opportunity and want to thank Billboard for this chance. I especially want to thank them for making this show possible for me to attend. 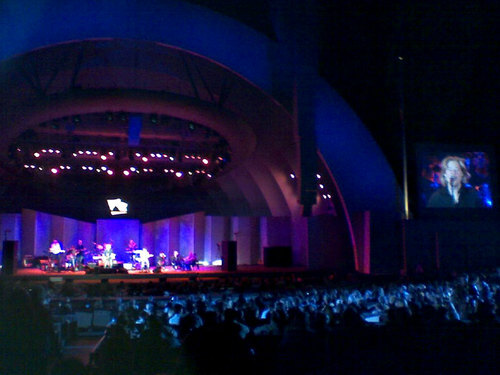 This was my first time at the historic Hollywood Bowl, the largest open-air amphitheatre I’ve ever visited. Seated in a comfy terrace box seat with removable tables, I was surrounded by similar booths with couples and groups having an outdoor picnic under a cool Los Angeles night sky. I look around and it’s just thousands upon thousands of people, all there for one reason, Hall and Oates. An overview of my reviews this summer, one can see that I’m a big fan of rock music, although my musical tastes actually go deeper and are far more eclectic. I am just a bigger fan of seeing rock shows live. But, I’ve always had a strong connection to Hall & Oates. Their music is timeless and reaches audiences far and wide. 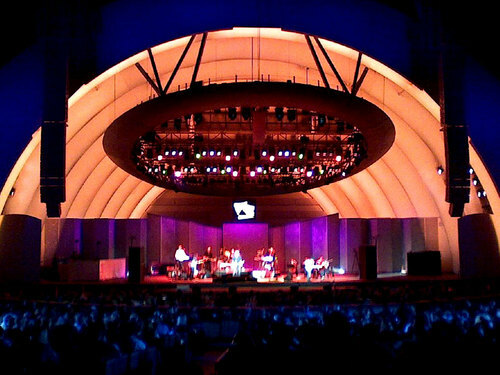 One can see that too looking into the mass of people at the Hollywood Bowl. Although predominantly older, there were others in attendance that looked to be in their 20s, like yours truly. Armed with rock and soul, Hall & Oates took the stage kicking things off with one of their biggest charting hits, “Maneater”. Darryl Hall’s voice sounds almost better than ever. You could close your eyes and almost feel like you’re back in 1982 there in the studio listening to the H2O recording session. John Oates’ harmonizing vocals and guitar playing were right there in step. Both looked better than ever as well up on stage. Burning through a set list of massive hits like “Say It Isn’t So”, “One on One”, “She’s Gone”, and smaller hits like “Wait For Me” and the more recent “Do It For Love”, the crowd really started getting into things during “I Can’t Go For That (No Can Do)” thanks in part to a breathtaking saxophone solo by Charles DeChant. As readers may or may not know, Hall & Oates had the best backing/studio band in the 1980s. When you put on a Hall & Oates record, that’s DeChant playing saxophone on it. Hearing is talent live was a special moment as well. Guitarist Tom “T-Bone” Wolk is another long-time and intricate member to Hall & Oates’ band, and shined with a couple great solos of his own. But DeChant’s solo was a thing that brought the thousands in attendance to their feet, cheering wildly. An even sweeter addition to the live performance was the inclusion of a string section. This brought new layers and enhanced the sound to so many of the duo’s hits. 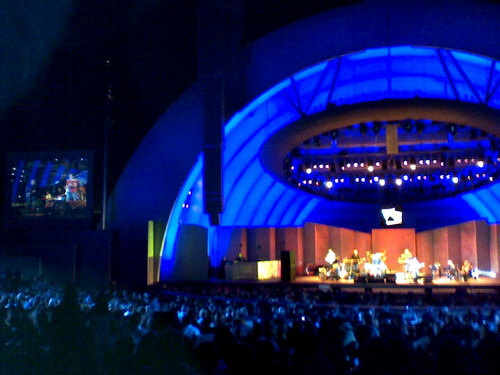 Hall & Oates were in such a zone on this night. They looked like they were having fun and genuinely were working off the energy of a packed house that was probably reminiscent of their prime in the 80s. It was a surreal experience that I don’t think I’ve ever experienced at any other show. To prove once again why they are the kings of rock & soul, the duo gave a great rendition of Marvin Gaye’s “What’s Going On?” Hall’s vocal so smooth that it got everyone into the groove. The band left the stage shortly after, but would return thanks to popular demand from the crowd. This would not happen once, but twice! Rarely does a group’s performance command the crowd so much for a double encore. As they returned with more hits like “Rich Girl” and “You Make My Dreams Come True”, the ever-changing colors of the arching light fixtures burst into flashes reminiscent of stars in time with the music. For their final song, they closed with yet another cover, the beautiful “Me and Mrs. Jones”. With the love from the crowd, it seemed to pump even more soul into the band as Hall really killed it with this song. 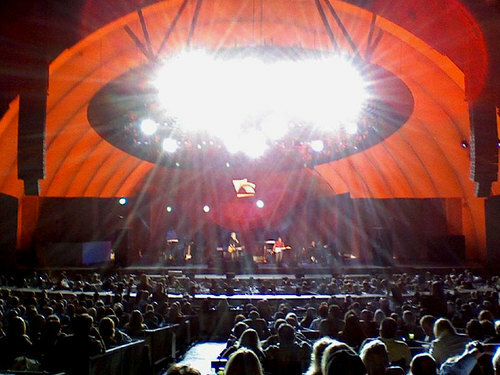 Fans actually called for yet another encore, which the band probably would have done, but the group was already running overtime at the bowl. This set was nothing short of spectacular and showed everyone how Hall & Oates are still on top of their game and that this was no “nostalgia show”. These guys still got it. I was mildly disappointed that I missed out on hearing other hits like “Kiss On My List”, “Private Eyes”, and “Out of Touch”, but when you have a number of hits like Hall & Oates, it’s a difficult task to fit everything in. A lot of people may think back and have a laugh at the goofy videos, the feminine look of their self-titled album cover, and Oates’ trademark 80s mustache (a thing that I wouldn’t mind seeing again, out of sheer curiosity), but when played one of their songs, will be stopped in their tracks. Hall & Oates brought the rock & soul sound to the forefront and broke color barriers with their music, music that is so beautifully performed that it can still captivate a crowd of 15,000 today. There is a new generation of music listeners today who probably have yet to be exposed to Hall & Oates music. The guys definitely still got it, so maybe there is still a chance to reach out. It also helps that current popular artists like the group Gym Class Heroes are big fans as well. They are due to put out a mashup album using Hall & Oates songs. Maybe this will bring a new fan base to the fold. This was definitely the perfect end to an amazing summer and I wouldn’t want it any other way. the whole time.) I never went to a concert where there was no encore. You know when the band leaves the stage and never returns not even for just 1 more song. What's up with that? Wow! That is so awesome that they can still rock it out after all these years!! Good review my friend! Wow! What a review, this the perfect way to send off your awesome summer of well written reviews. The thing that I most admired of this review is the appreciation of such a good band. Even though they are an eighties band, there sounds and skills were outside the realm of the eighties scene. That is what has made them still popular to this day. They didn't need big hair or funky clothes or big dance numbers, just the music. You have certainly had a memorable summer...one that I have loved reading about. I am so glad you had this opportunity! Thanks for sharing it with all of us! I was disapolinted, it seemed as if hall had mumbled some of the words, and how can you ebd the show on a song that isn't even yours? It was an amazing show as I was there too!